GET YOUR VITAMIN D3 NATURALLY -These delicious gummies, with the natural flavor of pomegranate, are made from cholecalciferol, the natural form of vitamin D, preferred for optimal absorption. 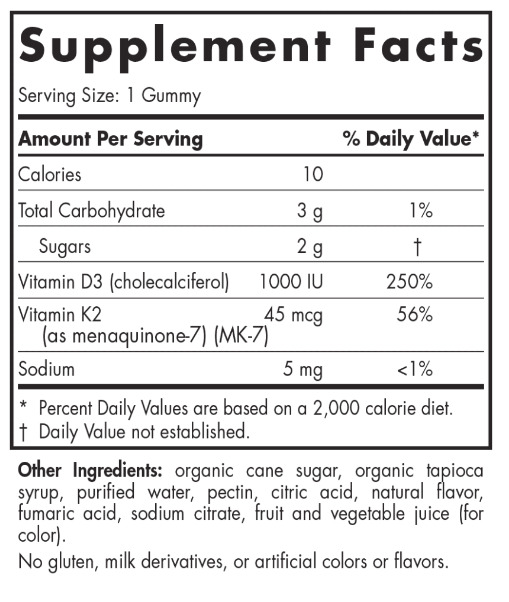 In addition, this gummy has an extra dose of Vitamin K2. While Vitamin D3 helps absorb calcium while Vitamin K2 helps the body use calcium to maintain bone density. 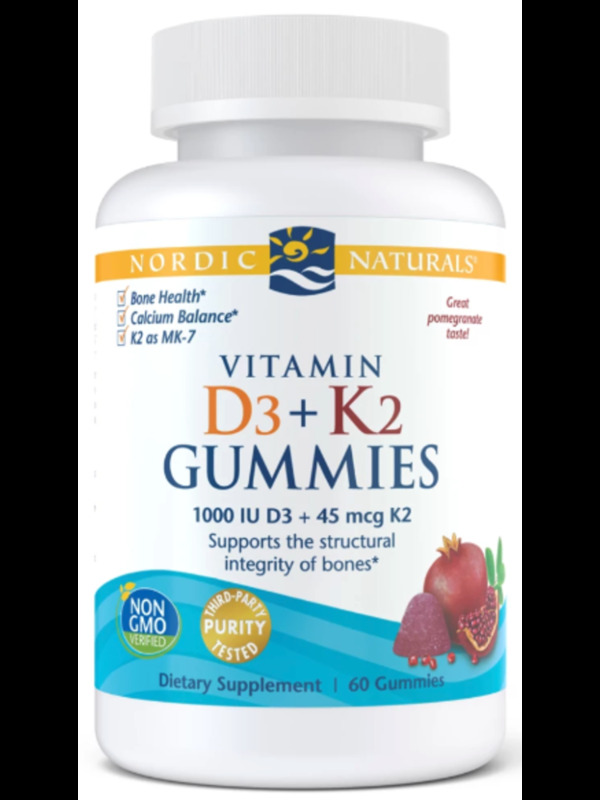 BENEFITS TO OPTIMIZE YOUR HEALTH - Nordic Naturals Vitamin D3+K2 Gummies provides 1000 I.U. of vitamin D3 and 45 mcg of Vitamin K2 in each serving. Vitamin D has been shown to perform a variety of functions in optimizing health including aiding in mineral absorption, and supporting immune system and nervous system function. Calcium requires vitamin D for absorption but you may not get enough from sun and diet alone. Supplement with these yummy gummies. 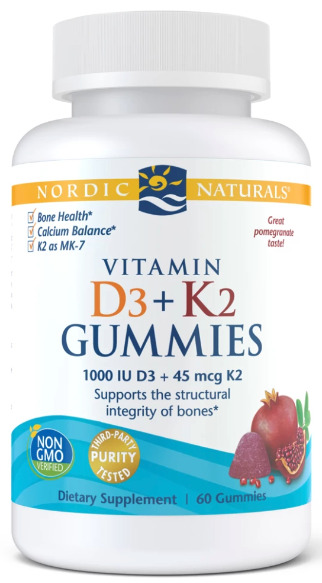 GREAT TASTE, GOOD FOR YOU - Nordic Naturals Vitamin D3+K2 Gummies come in a delicious, natural pomegranate flavor. 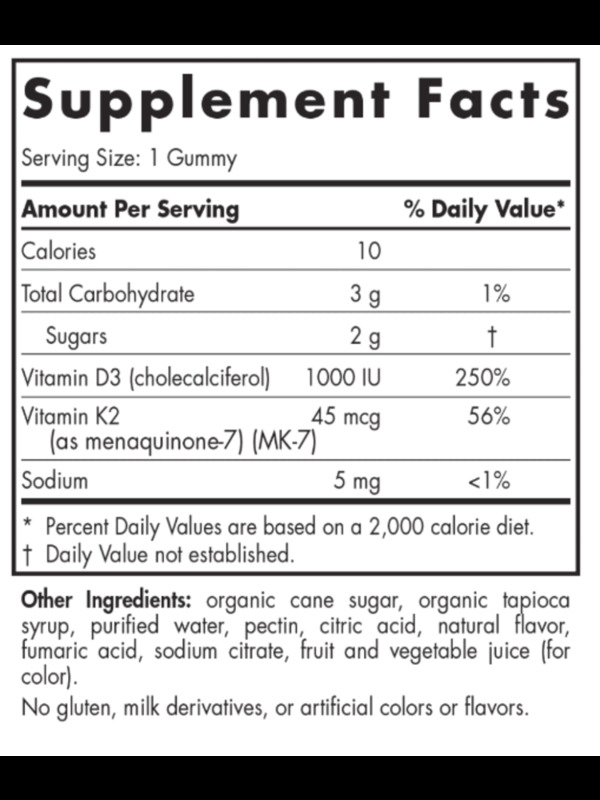 Pectin based and gelatin free, these gummies contain no artificial coloring, flavoring, or preservatives. Getting your all your vitamins and minerals doesn't have to be boring. 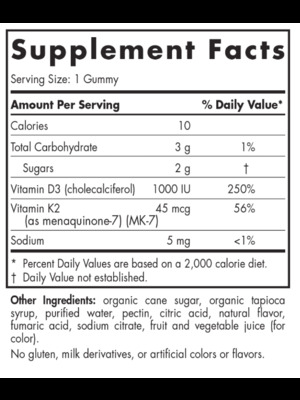 Give your body and spirit a boost taking your vitamins in this chewable fun multivitamin gummy. PRODUCTS ARE NON GMO VERIFIED - Nordic Naturals has always been at the forefront of sustainable and ethical practices in the natural products industry. Since our founding, we have been committed to using only non-GMO ingredients. These are also gelatin, gluten and dairy free. To achieve this, our chewy gummies are pectin-based, and use only sustainably sourced, natural ingredients to create a vitamin with all the things you need without any fillers.